I drove to three of the about one dozen Targets in my big city yesterday and I’ve got news! 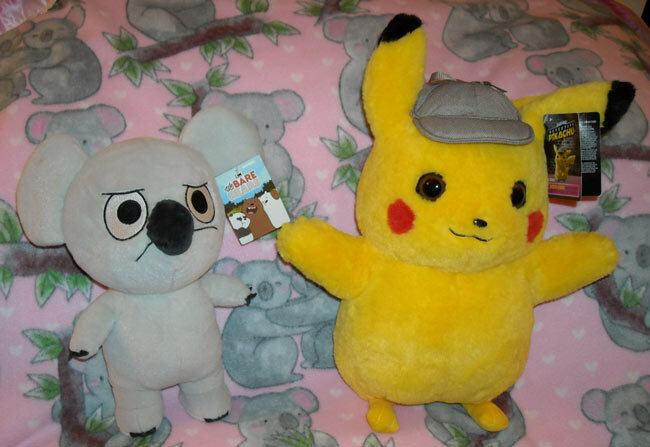 As you can see, I’ve managed to score a Wicked Cool “Real Scale” Detective Pikachu plush! It was the only one I saw on the shelf yesterday! 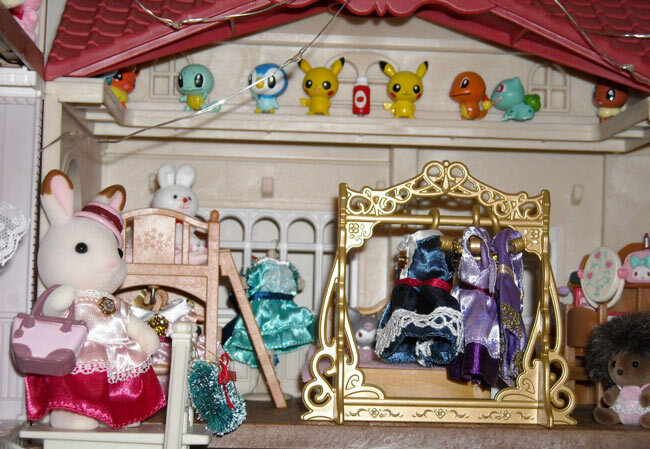 I also spotted posable Mewtwo and Mr. Mime movie plush, along with several smaller Detective Pikachu plush and a talking Ludicolo movie plush. This is just the start of a huge wave of movie merchandise, most stores list release dates for items in the next two weeks, including some books, TCG items and Wicked Cool figures. The Real Scale plush runs around $30; the smaller plush around $15. Don’t feed the scalpers! Standing next to my new best buddy and tying in to a previous Pojo column involving We Bare Bears and a Pojo’s Unofficial Team Komala purchase from The Australian Koala foundation, we find a very disgruntled Nom Nom who not very humbly would have you know he has the maximum number of stars at The Animal Kingdom’s website from which I purchased the plush—after all he is… or now maybe was-?… the #1 Internet Celebrity (this is all getting very confusing for our friend Professor Snape!). Here’s a link to The Animal Kingdom, from which I received my plush in about 48 hours with just inexpensive First Class USPS delivery (comes with tracking number), that’s outstanding customer service and I received quick response to my e-mail inquiry sent ever so early in the business day! With the current popularity of koalas and koala characters in the US, it’s important for fans to realize the adorable marsupials are in big trouble Down Under. The latest scientific articles I’ve been browsing online project the koala could go extinct as soon as 2050 if something is not done soon (i.e. Koala Protection Act). You can lend your voice and support via The World Wildlife Federation, US AZA Species Survival Plan zoos (such as San Diego or Columbus zoos) or my favorite, The Australian Koala Foundation (www.savethekoala.com). Sign those petitions to the AU government, adopt a koala, donate funds, buy gifts, etc. from these organization to help (did I mention anime fans snacking on Lotte Koala’s March cookies are indirectly supporting The Australian Koala Foundation? Those are available in Asian food sections/grocers including Meijer!). Next up on the birthday list, we have Sylvanian Families (known now as Calico Critters in the US, originally created in Japan, launched March 20, 1985). I got my first Sylvanian Families toys around 1986 while I worked my first job out of college. I had four Critters who all survived an arson of our apartment building. It was a 30 year dream to have my own Calico Critters house, which I realized over a year ago. I’ve enclosed a peep (pardon the Easter pun!) into my Critters’ home, hosted by Town series mother Hopscotch/Chocolate Rabbit. As you can see, my Critters are big Pokémon fans, I managed to snare some of the final wave of Tomy Pokémon Petite Pals at Tuesday Morning closeout store! They are perched on the roof ledge of a Red Roof Country Home. Now that Toys ‘R’ Us is gone, I purchase my Calico Critters from Learning Express, Meijer and Walmart. Learning Express has the absolute best selection, especially of newer/exclusive items and local shop owner Connie provides knowledgeable and friendly customer service (yes, totes jealous she went to Toy Fair NYC!). Learning Express also carries select Pokémon merchandise! Finally, Pojo’s Unofficial Team Buneary welcomes Scorbunny! Also, with Easter coming soon, as an animal welfare reminder, bunnies (and chicks) are not toys. Consider a wonderful plush or chocolate for Easter instead. If you are truly serious about adopting a rabbit, please visit The Houserabbit Society at https://rabbit.org/ first before making your plans. I had houserabbits for 23+ years and as even the ASPCA will tell you, they require a lot of time, effort and money to properly care for them. Since they are considered “exotics,” vet bills can be quite high. Releasing a pet rabbit into the wild is a death sentence (domesticated rabbits don’t have the proper instincts about what to eat [avoiding poisonous items] or how to avoid predators, etc.) and rabbits are often abandoned after the novelty wears off and/or the bunny, now a rabbit, becomes your own personal little hellion about the house (think Fluttershy’s Angel Bunny from My Little Pony—he’s a very good example of a spoiled rotten demanding houserabbit). Rabbits are wonderful pets, but only if you understand and can meet their very specific needs. Team Buneary thanks you for considering carefully before adoption. Detective Pikachu and I will be viewing Tuesday’s new Pokémon Viz DVD release “The Power of Us” this weekend (and I’ve got We Bare Bears “Viral Video” DVD on order from Barnes & Noble)! Enjoy! PIKA!